Epigenetic gene regulation allows genes to be stably turned on or off without changing the underlying DNA sequence. Epigenetic changes are stable through mitosis and can sometimes even persist transgenerationally through meiosis. The ability of epigenetic marks to persist through cell division and between generations means that they have the potential to contribute to evolution, independent of any change in underlying DNA sequence, by generating diversity that could be acted on by natural selection. Epigenetic regulation is often perturbed in cancer, both through changes in entire epigenetic pathways and through altered epigenetic regulation of specific genes. Thus understanding whether epigenetic differences can contribute to evolution will help us to understand how epigenetic changes in cancer cells contribute to the development of disease. 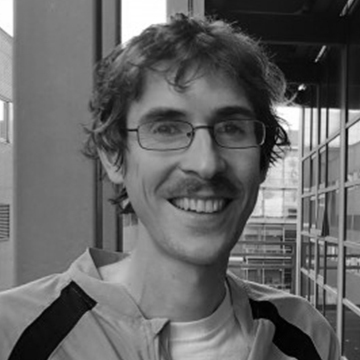 My laboratory uses two approaches to investigate the connections between epigenetic gene regulation and evolution. First, we are carrying out in lab evolution experiments using the simple laboratory nematode Caenorhabditis elegans, to test the extent to which epigenetic differences between individuals can contribute to evolution in the absence of changes in DNA sequence. Second, we are investigating the evolution of a variety of epigenetic pathways, including small RNAs such as Piwi-interacting RNAs (piRNAs), DNA methylation and histone modification. To study this we are using comparative genomics across metazoan organisms to generate hypotheses that we test using C. elegans or in mammalian cells. This approach allows us to uncover potential reasons underlying changes in epigenetic regulation both between species and within cancer cells. DNA methylation, which is conserved across eukaryotes, has nevertheless been frequently lost in metazoans. We discovered that DNA methyltransferases coevolve with ALKB2, such that ALKB2 is often lost when DNA methylation is not present. We explained this by demonstrating that the enzymes that introduce DNA methylation also introduce DNA alkylation damage in the form of the highly toxic lesion 3-methyl-cytosine into DNA, which we quantified using mass spectrometry showing that 3meC is lost in cells without DNA methyltransferases (A). 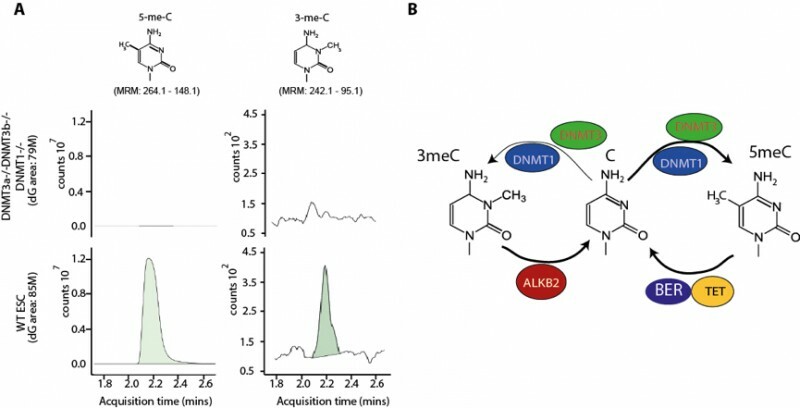 As a result DNA methylation within genomes requires the presence of the DNA repair enzyme ALKB2, which repairs alkylation damage to protect the genome from the off-target DNA methyltransferase activity (B). Thus, alkylation damage is a cost of DNA methylation, potentially explaining why DNA methylation has been lost altogether in many species, and may be a factor driving hypomethylation of DNA in cancer (Rosic, Amourox et al., Nature Genetics, In Press). Belicard T, Jareosettasin P, Sarkies P. (2018). The piRNA pathway responds to environmental signals to establish intergenerational adaptation to stress. BMC Biol., 16(1), 103. Rosic S, Amouroux R, Requena C, Gomes A, Emperle M, Beltran T, Rane J, Linnet J, Selkirk ME, Schiffer P, Bancroft A, Grencis RK, Jeltsch A, Hajkova P, Sarkies P. (2018). Evolutionary analysis indicates that DNA alkylation damage is a byproduct of cytosine DNA methyltransferase activity. Nature Genetics 50, 452–459. Lewis S, Quales K, Yang Y, Tanguy M, Frezal L, Smith S, Sharma P, Cordaux R, Gilbert C, Giraud I, Collins D, Zamore P, Miska EA, Sarkies P, Jiggins F. (2018). Pan-arthropod analysis reveals somatic piRNAs as an ancestral defence against transposable elements. Nature Ecology and Evolution 2(1), 174. Doi: 10.1038/s41559-017-0403-4. Li R, Ren X, Bi Y, Ho VWS, Hsieh C-L, Young A, Zhang Z, Lin T, Zhao Y, Miao L, Sarkies P, Zhao Z. (2016). Specific downregulation of spermatogenesis genes targeted by 22G RNAs in hybrid sterile males associated with an X-Chromosome introgression. Genome Research 26(9), 1219-1232. Sarkies P, Selkirk ME, Jones JT, Blok V, Boothby T, Goldstein B, Hanelt B, Ardila-Garcia A, Fast NM, Schiffer PM, Kraus C, Taylor MJ, Koutsovoulos G, Blaxter ML, Miska EA. (2015). Ancient and novel small RNA pathways compensate for the loss of piRNAs in multiple independent nematode lineages. Plos Biol 13(2), e100206. Sarkies P, Selkirk ME, Jones JT, Blok V, Boothby T, Goldstein B, Hanelt B, Ardila-Garcia A, Fast NM, Schiffer PM, Kraus C, Taylor MJ, Koutsovoulos G, Blaxter ML, Miska EA. (2015). Ancient and Novel Small RNA Pathways Compensate for the Loss of piRNAs in Multiple Independent Nematode Lineages. PLoS Biology 13(2), e1002061. Weick E-M, Sarkies P, Silva N, Chen RA, Moss SMM, Cording AC, Ahringer J, Martinez-Perez E, Miska EA. (2014). PRDE-1 is a nuclear factor essential for the biogenesis of ruby motif-dependent piRNAs in c. elegans. Genes & Development 28(7), 783–796. Simon M*, Sarkies P*, Ikegami K, Doebley A-L, Goldstein LD, Mitchell J, Sakaguchi A, Miska, EA, Ahmed S. (2014). Reduced Insulin/IGF-1 signaling restores germ cell immortality to caenorhabditis elegans piwi mutants. Cell Reports 7(3), 762–773. Sarkies P, Miska EA. (2013). RNAi pathways in the recognition of foreign RNA: antiviral responses and host-parasite interactions in nematodes. Biochemical Society Transactions 41(4), 876–880. Ashe A*, Bélicard T*, Le Pen J*, Sarkies P*, Frézal L, Lehrbach NJ, Félix M-A, Miska EA. (2013). A deletion polymorphism in the caenorhabditis elegans RIG-i homolog disables viral RNA dicing and antiviral immunity. eLife 2, e00994. Sarkies P*, Ashe A*, Le Pen J, McKie MA, Miska EA. (2013). Competition between virus-derived and endogenous small RNAs regulates gene expression in caenorhabditis elegans. Genome Research 23(8), 1258–1270. Sarkies P, Sale JE. (2012). Cellular epigenetic stability and cancer. Trends in Genetics 28(3), 118–127. Sarkies P, Reams C, Simpson LJ, Sale JE. (2010). Epigenetic instability due to defective replication of structured DNA. Molecular Cell 40(5), 703–713.